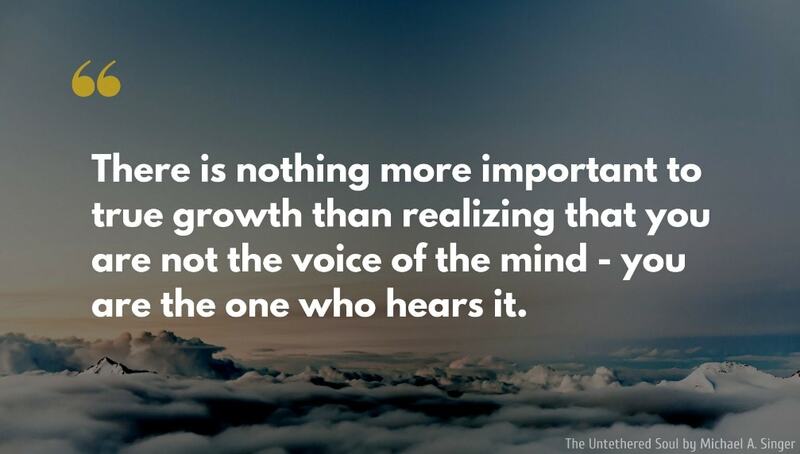 There is nothing more important to true growth than realizing that you are not the voice of the mind - you are the one who hears it. If you truly love someone, your love sees past their humanness. The mind is a place where the soul goes to hide from the heart. When a problem is disturbing you, don't ask, "What should I do about it?" Ask, "What part of me is being disturbed by this? 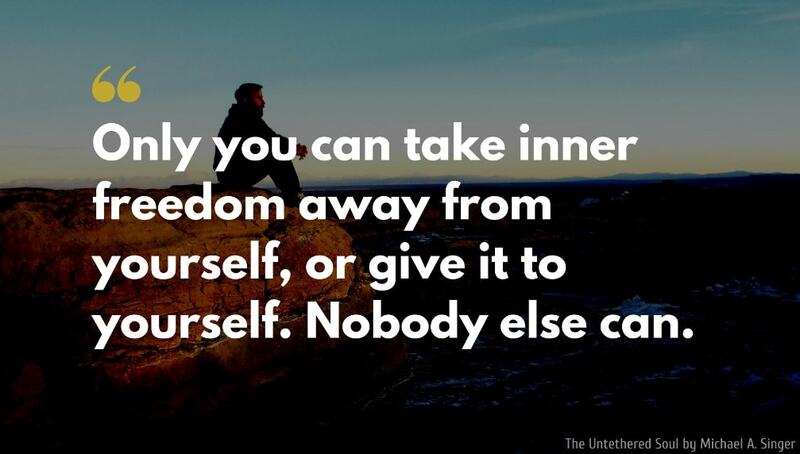 Only you can take inner freedom away from yourself, or give it to yourself. Nobody else can. You have to understand that it is your attempt to get special experiences from life that makes you miss the actual experience of life. Ninety-nine percent of your thoughts are a complete waste of time. They do nothing but freak you out. The reward for not protecting your psyche is liberation. You are free to walk this world without a problem on your mind. You are just having fun experiencing whatever happens next. 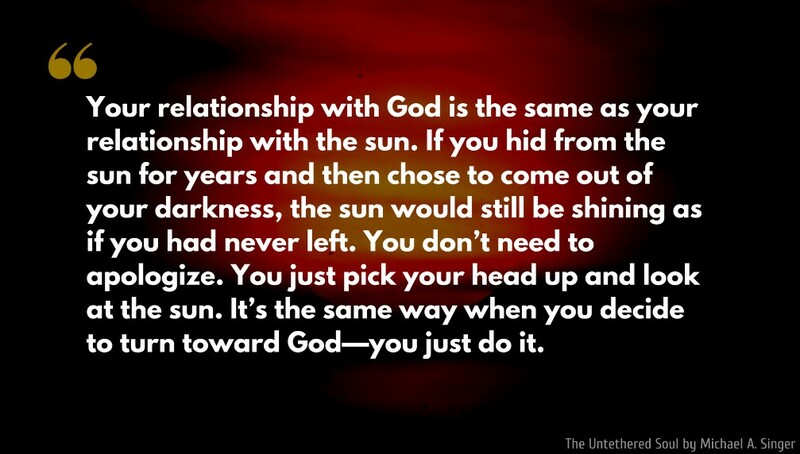 Your relationship with God is the same as your relationship with the sun. If you hid from the sun for years and then chose to come out of your darkness, the sun would still be shining as if you had never left. You don’t need to apologize. You just pick your head up and look at the sun. It’s the same way when you decide to turn toward God—you just do it. Eventually you will see that the real cause of problem is not life itself. It's the commotion the mind makes about life that really causes the problems. You naturally begin to center more and more on the spiritual part of your being. You do this not by reaching for the Spirit, but by letting go of the rest. 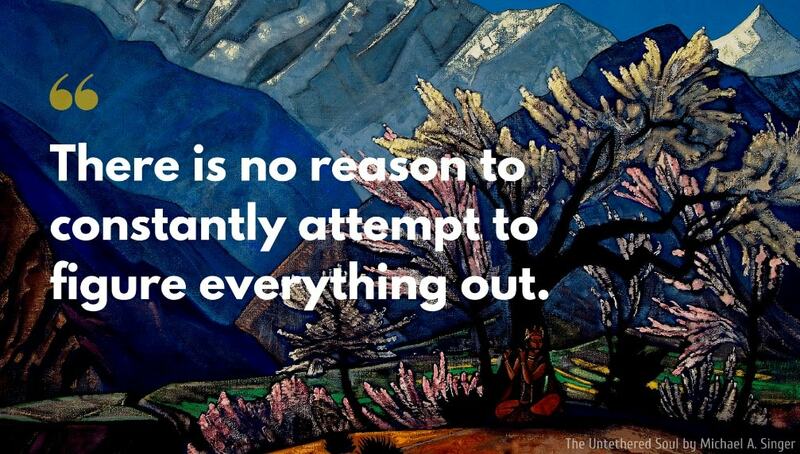 There is no reason to constantly attempt to figure everything out. Billions of things are going on in this world. You can think about it all you want, but life is still going to keep on happening. Everything will be okay as soon as youare okay with everything. And that’s the only time everything will be okay. You have given your mind an impossible task by asking it to manipulate the world in order to fix your personal inner problems… Your mind is not qualified for that job. Fire it, and let go of your inner problems instead. 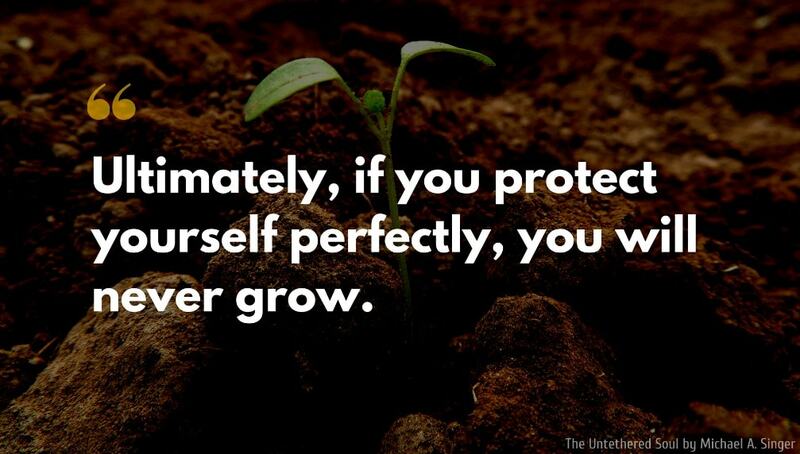 Ultimately, if you protect yourself perfectly, you will never grow. Stress only happens when you resist life’s events… If you have no preference, if the only thing you want is to remain centered, then life unfolds while you simply feel for the center. Every time you do something in the name of avoiding pain, that something becomes a link that holds the potential for the pain you are avoiding… Your attempt to avoid this pain has created layers upon layers of sensitivities that are all linked to the hidden pain. To be free, simply view pain as a temporary shift in your energy flow… If you relax when the pain comes up inside your heart, and actually dare to face it, it will pass. 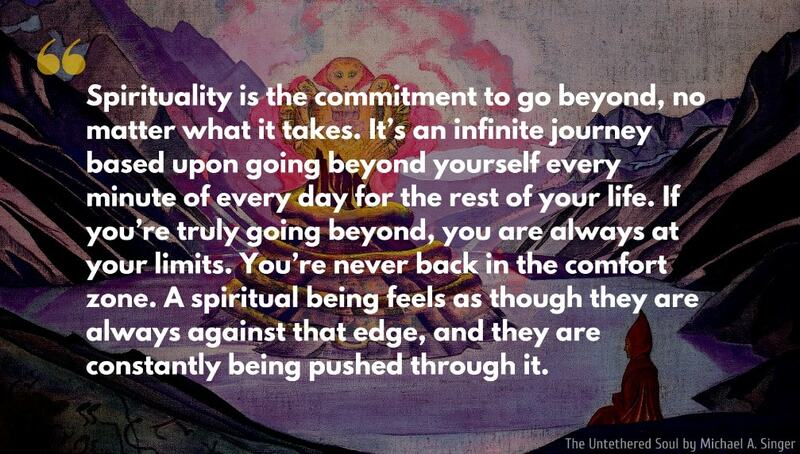 Spirituality is the commitment to go beyond, no matter what it takes. It’s an infinite journey based upon going beyond yourself every minute of every day for the rest of your life. If you’re truly going beyond, you are always at your limits. You’re never back in the comfort zone. A spiritual being feels as though they are always against that edge, and they are constantly being pushed through it. People tend to burden themselves with so many choices. But, in the end, you can throw it all away and just make one basic, underlying decision: Do you want to be happy, or do you not want to be happy? It’s really that simple. Once you make that choice, your path through life becomes totally clear. The only permanent solution to your problems is to go inside and let go of the part of you that seems to have so many problems with reality. Once you do that, you'll be clear enough to deal with what's left. If, for even one moment, you can look at someone with the eyes of true love, you'll know those eyes are not yours. Your eyes could never look with that amount of love. Your eyes could never be that unconditional. Your eyes could never, even in a million years, see only beauty and total perfection in your beloved. Those are the eyes of God looking down through you. If you decide that you're going to be happy from now on for the rest of your life, you will not only be happy, you will become enlightened. 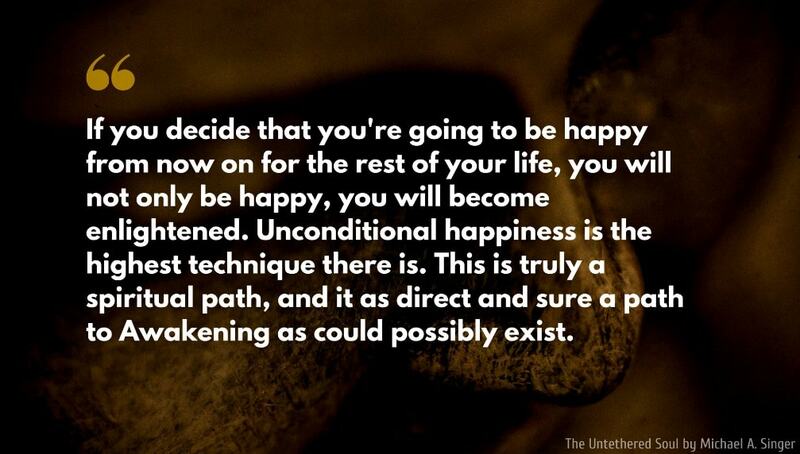 Unconditional happiness is the highest technique there is. This is truly a spiritual path, and it as direct and sure a path to Awakening as could possibly exist. Instead of being encouraged to feel completely protected, loved, honored, and respected by the Divine Force, you've been taught that you're being judged. Because you've been taught that, you feel guilt and fear. But guilt and fear do not open you connection to the Divine; they only serve to close your heart. The reality is that God's way is love, and you can see this for yourself. There is nothing wrong with feeling the energies of fear, jealousy, or attraction. It’s not your fault that such energies exist. 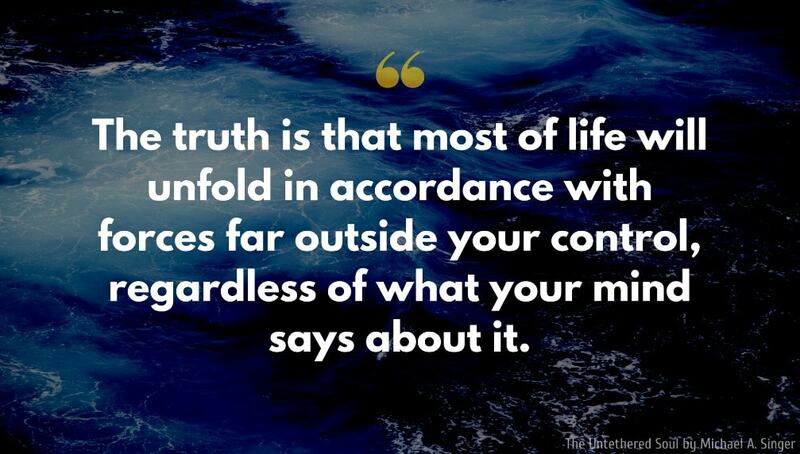 All the attractions, repulsions, thoughts, and feelings don’t make any difference. They don’t make you pure or impure. They are not you. 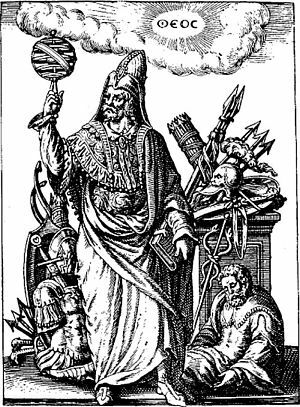 You are the one who’s watching, and that one is pure consciousness. Don’t think you’d be free if you just didn’t have these kinds of feelings. It’s not true. If you can be free even though you’re having these kinds of feelings, then you’re really free—because there will always be something. If you want to be happy, you have to let go of the part of you that wants to create melodrama. This is the part that thinks there’s a reason not to be happy. You have to transcend the personal, and as you do, you will naturally awaken to the higher aspects of your being. In the end, enjoying life’s experiences is the only rational thing to do. You’re sitting on a planet spinning around in the middle of absolutely nowhere. Go ahead, take a look at reality. You’re floating in empty space in a universe that goes on forever. If you have to be here, at least be happy and enjoy the experience. You’re going to die anyway. Things are going to happen anyway. Why shouldn’t you be happy? You gain nothing by being bothered by life’s events. It doesn’t change the world; you just suffer. There’s always going to be something that can bother you, if you let it. To get some distance from this, you first need to get some perspective. Walk outside on a clear night and just look up into the sky. You are sitting on a planet spinning around in the middle of absolutely nowhere. Though you can only see a few thousand stars, there are hundreds of billions of stars in our Milky Way Galaxy alone. In fact, it is estimated that there are over a trillion stars in the Spiral Galaxy. And that galaxy would look like one star to us, if we could even see it. You’re just standing on one little ball of dirt and spinning around one of the stars. From that perspective, do you really care what people think about your clothes or your car? Do you really need to feel embarrassed if you forget someone’s name? How can you let these meaningless things cause pain? If you want out, if you want a decent life, you had better not devote your life to avoiding psychological pain. You had better not spend your life worrying about whether people like you or whether your car impresses people. What kind of life is that? It is a life of pain. You may not think that you feel pain that often, but you really do. To spend your life avoiding pain means it’s always right behind you. 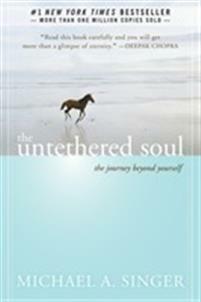 The Untethered Soul is a book written by the wise spiritual teacher and author Michael A. Singer. The book explores the nature of the spiritual journey, its implications and the beauty and existential peace that lies therein.